Suppose you had to choose between two Presidential candidates, one of whom had spent 20 years in Congress plus had considerable other relevant experience and the other of whom had about half a dozen years in the Illinois state legislature and 2 years in Congress. Which one do you think would make a better President? If you chose #1, congratulations, you picked James Buchanan over Abraham Lincoln. Your pick disagrees with that of most historians, who see Lincoln as the greatest President ever and Buchanan as the second worst ever, better only than Warren "Teapot Dome" Harding. Both served in what was probably the most difficult period in American history, where slavery and secession tore the nation asunder. Before becoming President, Buchanan had served 6 years in the Pennsylvania state legislature, 10 years in the U.S. House of Representatives, 4 years as ambassador to Russia, 10 years in the Senate, 4 years as Secretary of State, and 4 years as Ambassador to England. Talk about experience, Buchanan did just about everything except serve on the Supreme Court, a job he was offered by President Polk and refused. Yet by any measure, he wasn't up to the job as President. In contrast, Abraham Lincoln served 8 years in the Illinois legislature and one term in the U.S. House (1847-1849), a decade before becoming President. The rest of the time he was a lawyer in private practice, a bit thin one might say. Of course, these are only two data points. What about all the other Presidents? Weren't the experienced ones the better Presidents? Fortunately, there have been a number of surveys of presidential greatness, some by professional historians and some by the general public. Many of these are given in the Wikipedia page on Historical rankings of U.S. Presidents. The amount of experience each President had before taking office is well known since the lives of all Presidents have been extremely well documented. Thus the basic data--years of experience and ranking--are available making a statistical analysis of experience vs. greatness possible. David A. Levine of New York has collected the data from Wikipedia and done some analysis of it. Let's start with a table of the Presidents listed in order of their consensus rank in the 12 surveys given in the above Wikipedia page. As practically everyone knows, the previous President is often called Bush 43 (to distinguish him from his father, Bush 41). However, when George W. Bush was elected, only 41 people had served as President before him. Stephen Cleveland (commonly known as Grover) won the popular vote three times, in 1884, 1888, and 1892, but lost the electoral college to Benjamin Harrison in 1888. Having actually won two consecutive elections, he ran again (with Adlai E. Stevenson, grandfather of the 1952 and 1956 Democratic candidate, as his running mate) in 1892 and won, making him the 22nd President and also the 24th President. In the table above, the top quartile (actually 11) are colored deep green, 2nd quartile (actually 10) is colored light green, the 3rd quartile (actually 11) is colored light red, and the bottom quartile (actually 10) is colored deep red. Recent Presidents have not been included in all the historical surveys, so their rankings should be taken with a grain (or better yet, a metric ton) of sodium chloride. Bush 43, for example, was rated only twice and one of the ratings was by the Wall St. Journal. Rankings of recent Presidents will no doubt change in future years when the wisdom of their decisions (or lack thereof) becomes more apparent. All experience is not the same. How do you compare being governor of a small state with being governor of a big state? Is being Vice President worth a pitcher of warm beer or any other fluid? Is being a state senator more or less relevant to being president than being Secretary of Commerce? Impossible to say for sure, so I have just added up the total number of years of experience as a proxy for experience. If you want to weight the columns differently, the data are available in both Excel format and .csv format so you can slice and dice them as you wish. Before becoming a data analyst though, you should a first read the Notes on presidential experience document David wrote. Now for the test. In the table below, the Presidents are sorted on experience. The most experienced President was James Buchanan, with Lyndon Johnson and Jerry Ford getting the silver and bronze medals, respectively. Chester A. Arthur had a mere 1.5 years experience before he was elevated to the Presidency upon the asassination of President Garfield. If experience and greatness correlate, one would expect the top half of the table (the most experienced Presidents) to be mostly green (good) and the bottom half (inexperienced) to be mostly red (bad). If there is no correlation, the red and green should be random. Indeed, the latter seems to be the case. 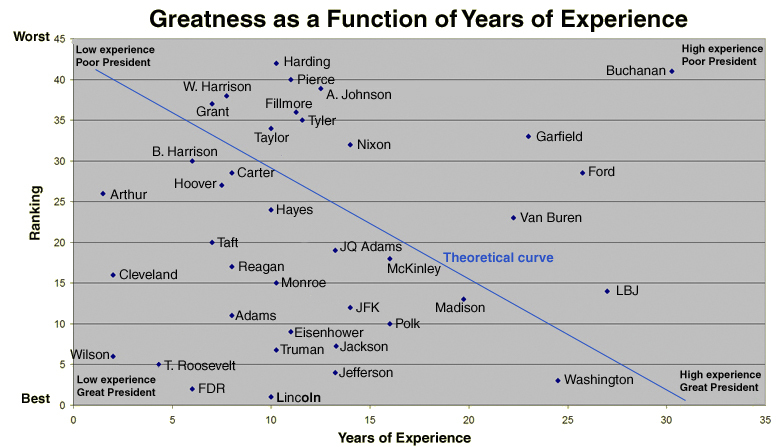 The top half in terms of experience (above the gray bar) has 11 bad Presidents and 10 good ones, essentially no correlation between greatness and experience. If you don't like this result and want to try for a better one, just get the spreadsheet and start weighting the columns. Undoubtedly you will be able to get a different result if you try hard enough. But the point remains, the Presidents with a lot of experience have not been more outstanding than those with little experience. Here is a scatterplot of rank vs. experience. 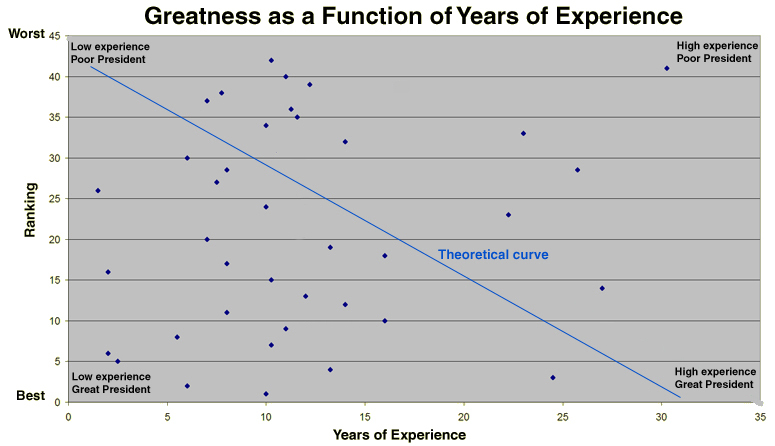 If more experience makes you a better President, the dots, each of which is one President, should fall somewhere along the blue theoretical curve--more experience gives you a higher rank (1 being the highest rank). The two Bushes and Clinton are not shown since it is much too early to draw historical judgments on them. One needs a very vivid imagination to perceive the data points falling along the blue line. There does not appear to be any relation between experience and greatness. Here is the same scatterplot, but now with the Presidents labeled. The Presidents (way) under the line might be regarded as overperformers. They didn't have much experience going into office, but did pretty well once there. The ones (way) above the line had lots of experience but were not good Presidents.